Whenever you imagine a knight from the medieval era, it is typically a warrior in shining armor, his features concealed by a visored helmet. This Classic Knight Costume Helmet is a faithful recreation of the traditional knights trusty helmet. 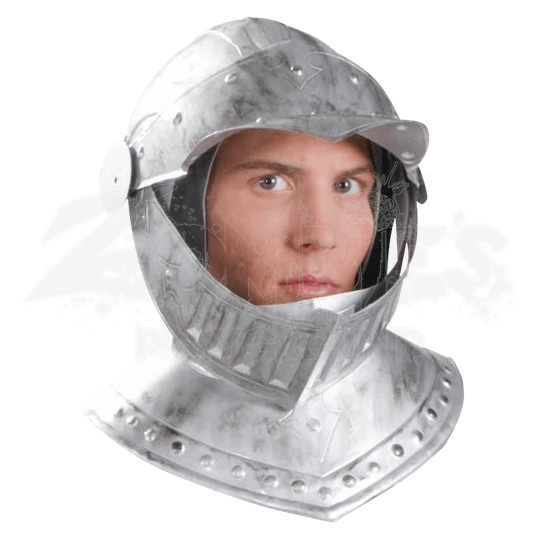 Being modeled after a typical knights helmet, this costume helm features an attached neck cowl that looks like an authentic piece of armor. The helmet itself is rounded and covers much of the face, while featuring a broad visor as well as a rotating cover that can be raised to conceal and cover the face. The helm possesses a silver-metal finish that makes this costume helmet look like it is actually made from polished steel. This Classic Knight Costume Helmet is a must-have piece of headgear that will certainly make anyone look the part of a real knight in shining armor!